(Bloomberg) -- Deutsche Bank had to pay some of the highest rates among large banks to raise debt this year, highlighting a key obstacle in the lender’s turnaround effort. Deutsche Bank last week paid investors 230 basis points over benchmark interest rates for a senior seven-year bond that can absorb losses in a crisis, according to data compiled by Bloomberg. By comparison, French rival BNP Paribas SA last month offered 50 basis points less for equally-ranked notes that mature one year later. Investors are demanding higher returns to lend money to Deutsche Bank as the firm grapples with a prolonged decline in revenue. Finance chief James von Moltke said last year that the bank was caught in a “vicious circle” of declining revenue, sticky expenses, a lowered credit rating and rising funding costs. While the firm cut expenses, revenue and the price of funding remain a concern. Last week’s bond sale was part of a combined 3.6 billion euros in bonds issued by the lender to bolster capital ratios. Its borrowing costs are still lower than those of Italy’s UniCredit SpA, which paid the equivalent of 420 basis points over the euro benchmark for a private sale in November, at the height of the nation’s budget dispute with European Union officials. Deutsche Bank will issue as much as 6 billion euros in covered bonds, as much as 8 billion euros in senior preferred bonds and as much as 11 billion euros in senior non-preferred bonds this year, treasurer Dixit Joshi said on the same call. The bank’s troubles are also reflected in the cost of insuring its debt against default. 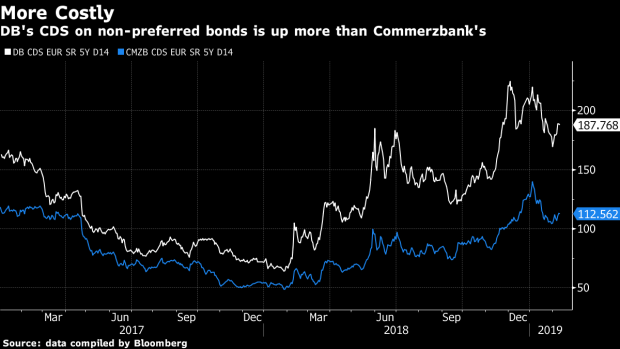 While credit-default swap contracts insuring against losses for five years have dropped from a two-year high, they’re still more expensive than that of peers like Commerzbank AG. Deutsche Bank said last week that it expects that a contract on its new preferred bonds, which can’t be bailed in in a crisis, will be available to use soon and should be significantly cheaper.